Would you believe that this is my first time ever posting a veggie burger recipe on my site? How did that happen? 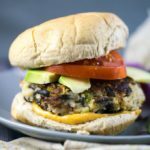 These vegan wild rice burgers are flavorfully made from simple ingredients, a new favorite of mine! 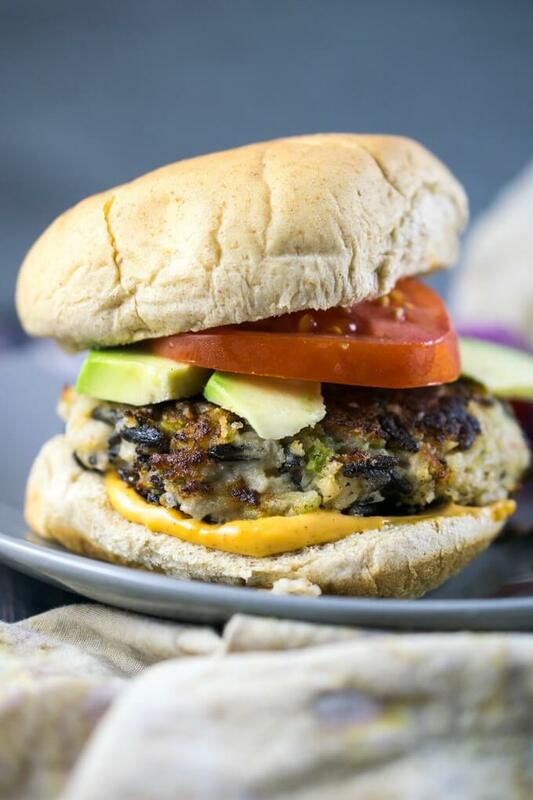 The inspiration for my wild rice burgers came originally from this non-vegan recipe by Pinch of Yum. I saw the title, I saw the delicious pictures, and I wanted it. (As you know, I tend to get strong cravings for wild rice). Usually I assume veggie burger recipes are going to have eggs in them. That’s easy enough for me to substitute around. But I certainly wasn’t prepared for this recipe to call for ONE AND A HALF CUPS OF MAYONNAISE. What the what? The original also had mushrooms, which totally isn’t my scene. All in all, it was pretty clear that I was on my own for recreating this Minnesota state fair classic. Apparently the MN staple also uses something called Jax Seasoning. I’ve never seen that in a store here so I seasoned my vegan wild rice burgers with a simple mix of paprika, black pepper, and a pinch of cumin. To solve the whole mayonnaise-and-breadcrumbs problem I used one of my favorite veggie burger tricks (*always* employed in my black bean burgers), which is to roast beans to cook out some of their excess moisture before adding them to the batter. This keeps the patties from being mushy. Say no to mushy veggie burgers! The rest of the wild rice burger mix is rounded out with a simple saute of garlic, celery and onion; a mixture of brown and wild rice; and just a dash of almond butter or other nut butter (substitute tomato paste if nut-free is needed) for binding. 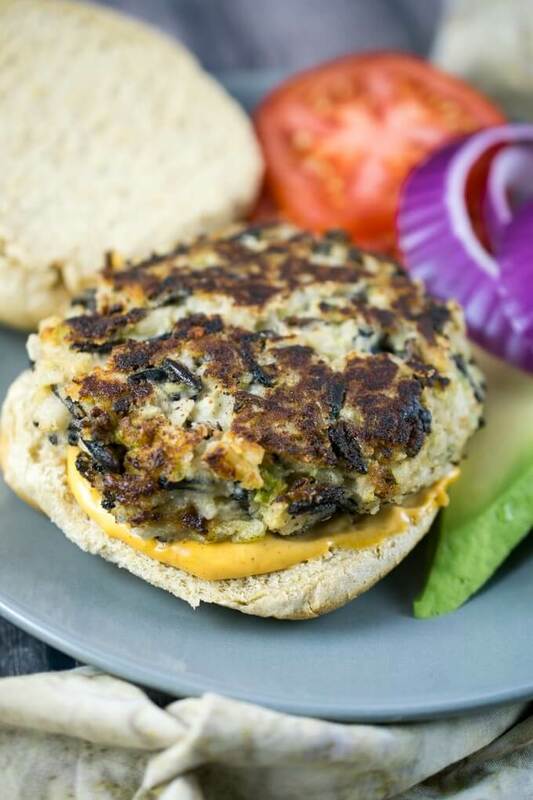 If you try these vegan wild rice burgers, let me know! You’ll dirty a few dishes but not many ingredients are needed and you should have some leftovers too. Bon appetit! 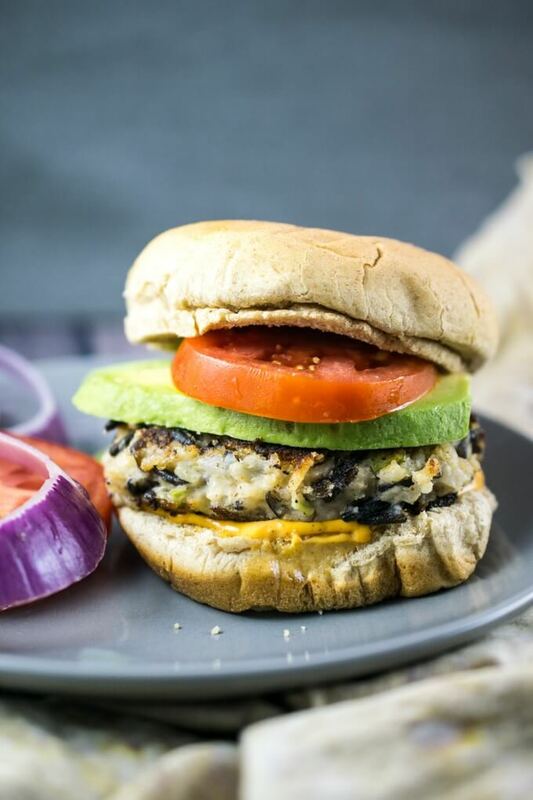 Vegan wild rice burgers: egg-free, dairy-free veggie burgers made from a hearty blend of brown and wild rice with cannellini or navy beans. These patties are gluten-free if using a GF bun or other serving option. Preheat the oven to 350 degrees Fahrenheit and lightly spray or grease a baking sheet. Drain the canned beans, reserving a couple of tablespoons of the bean liquid. Spread out the cooked beans in a single layer on the baking sheet. Bake for about 20 minutes, or until the beans are splitting open and starting to crisp. Remove from the oven. Meanwhile, heat about 1 tbsp olive oil in a skillet (preferably nonstick). Add the onion and celery and a pinch of salt. Cook, stirring occasionally, for about 4-6 minutes or until translucent and softened. Add the garlic and cook for 60 seconds more. Add the paprika, black pepper, cumin, and oregano and stir; cook for 30 seconds and then remove from the heat. Use a spatula to transfer the saute mixture to a food processor, and add the roasted white beans and almond butter. Pulse the mixture, stopping to scrape down the sides as needed, until a doughy consistency is formed with the added ingredients broken down into small pieces. Add the brown rice and pulse a few more times. Transfer the mixture to a bowl, season to taste with salt and pepper, and stir in the wild rice. If the mixture is too dry to shape into patties, add the reserved bean cooking liquid a couple of teaspoons at a time to bring it together. Shape into approximately 6 patties sized to the buns you are using. Add the remaining 1 tbsp olive oil to the skillet over medium heat. When hot, add shaped patties, leaving plenty of room between them. (You may need to cook in multiple batches). Cook for about 5 minutes per side, until browned and crisp. Serve hot with toppings of choice. Leftovers can be reheated carefully in the oven. RICE COOKING: I cooked 1/2 cup dry wild rice and 1/2 cup dry brown rice together in my rice cooker on the brown rice setting to get approximately the amount used for these wild rice burgers. HOMEMADE BEANS: This recipe calls for reserving some of the aquafaba (bean cooking liquid) to use for binding the burger patties as needed. You get aquafaba for free if using canned beans. If using homemade beans, reserve some of the cooking liquid and then reduce it down by half to thicken it; or use a mixture of ground flaxseeds and water in a 1:3 ratio instead of aquafaba. NUTRITION FACTS: Nutrition facts include whole wheat burger buns, tomato, avocado and red onion but exclude condiments. Bean roasting technique originally learned from Serious Eats. I have no idea what I did wrong. Followed to a T and I got mushy burgers. I will try again as these look amazing. They did taste great. My oven is on the fritz. Will they do well on the stovetop? Or would a toaster oven be a better option ? Hi Keah, so the burgers themselves are cooked on the stovetop already, you just need to roast the beans somehow. A toaster oven will definitely work for that part, I have used that method before. It takes a similar amount of time. Pan-roasting them might also work but I’m not completely sure. Made them last night. I added about 1 tablespoon of the bean liquid for binding. I was surprised by how the good texture is, and the flavor is amazing! These sound delicious and very interesting texturally, too. I think something’s off in the calorie calculation, though. 12g protein =48 cal; 15g carbs = 60 cal; & 1 g fat = 9 cal, so total would be 117 cal, using these weights…. Hi Patsy, you are totally right, I had an error in importing the nutrition facts from MyFitnessPal. Thanks so much for catching it. I just updated them.